The Mitsubishi Evolution brought boy (or girl) racers out of boyhood and into man (or woman) hood. Chances are, if you had a Peugeot 205 GTi or a souped up Nova in your misspent youth, you probably own, have owned or at the very least, wanted to own an Evo when you ‘grew up’. 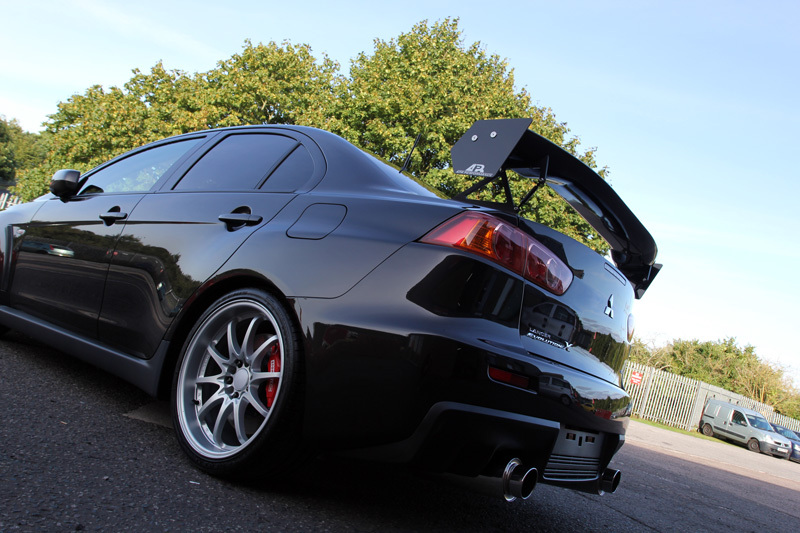 The Mitsubishi Lancer Evolution X FQ-300 GSR SST (pause for breath!) 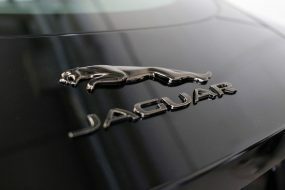 has the power, the handling and the rumble that set teenage pulses racing. The rise of the Fast & The Furious generation simply introduced a whole new set of people to the raw thrill that driving a Japanese performance car delivers. And what a performance: a 2-litre turbocharged engine delivering 291ps at 6500rpm, 407 Nm at 3500 rpm, propelling it from 0-62 in 4.7 seconds. The standard, twin-clutch, sports shift transmission moves effortlessly up and down the gears as required and Brembo brakes take care of the other end of that continuum. The Evo X has an upgraded suspension, giving the driver a softer ride over uneven road surfaces yet without compromising on grip or handling on tight corners. The Evo X is really the driver’s car, albeit with practical elements thrown in such as plenty of cabin space with room for four adults plus luggage! 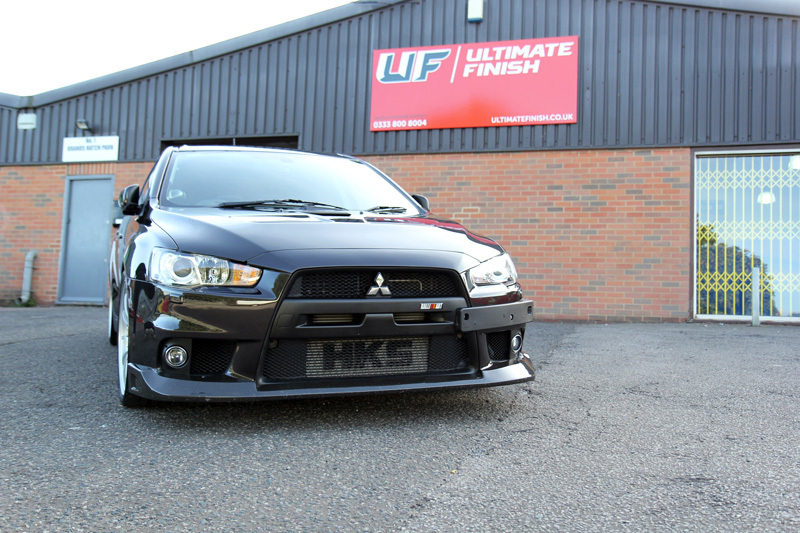 This Evo X arrived at UF’s Brands Hatch Detailing Studio with a variety of issues: typical for Japanese paintwork, the finish was quite soft. As a result, swirls, minor scratches and a few random deep scratches (RDS) were evident. In addition, acid rain and water spot deposits had etched into the paintwork, further dulling the look and masking the metallic flake in the Phantom Black colour. The unavoidable gravel rash peppered the front splitter, bonnet and sills. 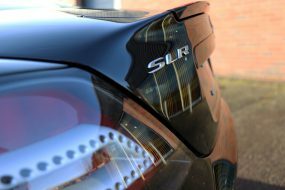 The owner had bought the car brand new in 2008 and was keen to have it returned to its former glory, so booked it in for a Paintwork Correction Treatment, Alloy Wheel Protection and to have the stone chips attended to. 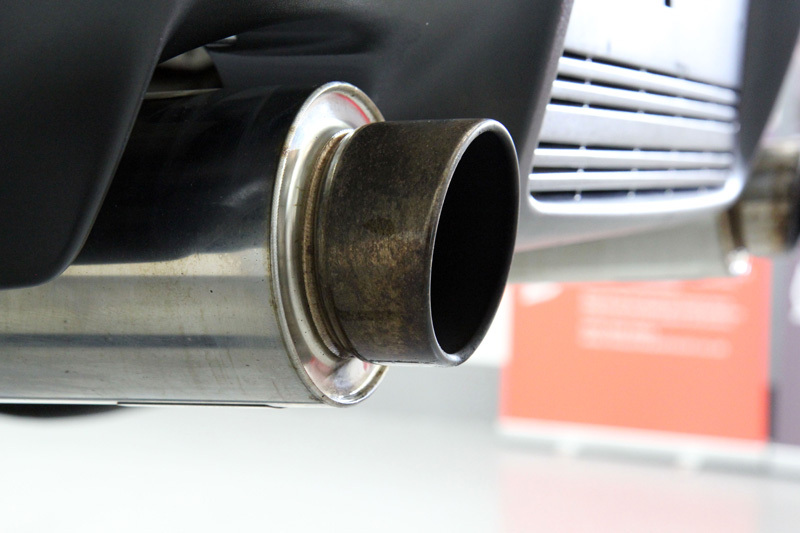 Prior to commencing treatments, the car first required decontaminating and degreasing. The sills and wheels were coated with tar deposits and brake dust build-up. First, Fireball Ultimate Tar Remover was used to dissolve the tar and sticky organic contamination from the wheels and bodywork. 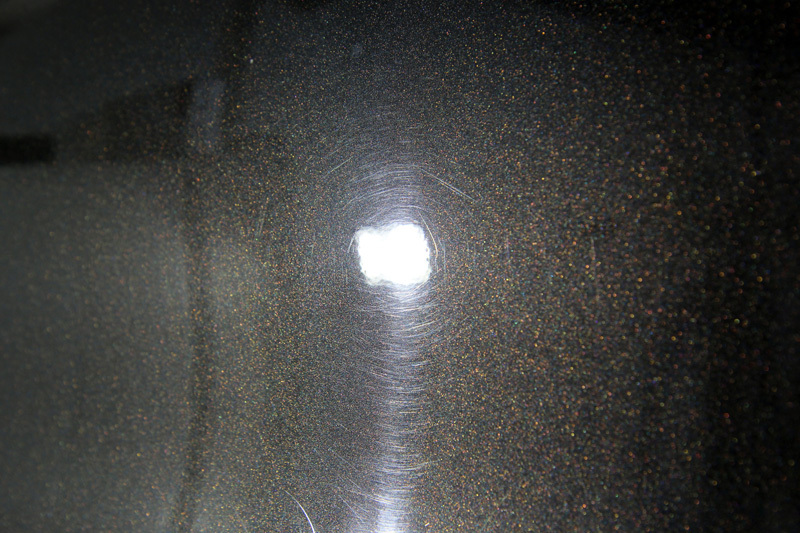 After rinsing the solution away, Fireball Ultimate Iron Burn was applied, the colour change function highlighting the areas of ferrous contamination. Ultimate Iron Burn reacts with the deposits, causing the particles to shrink and break their bond with the substrate. 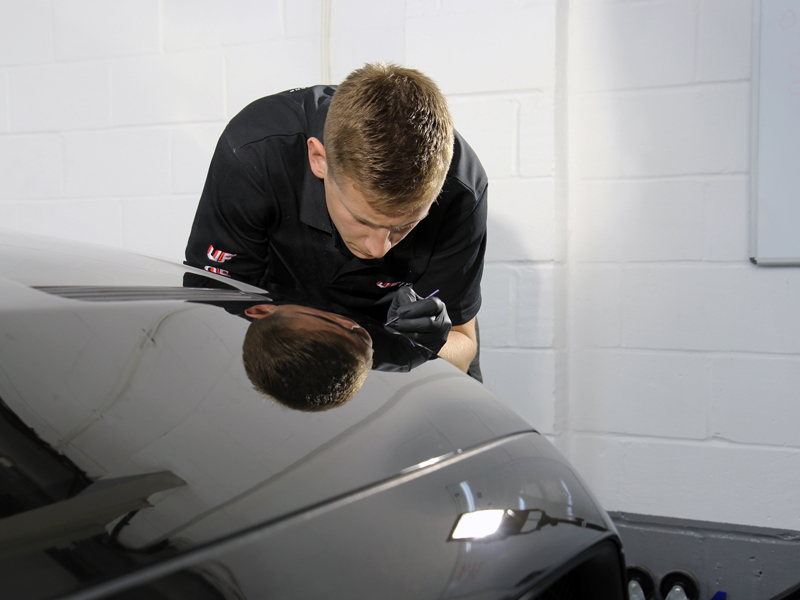 This allows them to be easily rinsed away without additional scrubbing with a wash mitt, an action which often puts scratches and swirls into the delicate lacquer finishes on wheels and bodywork. 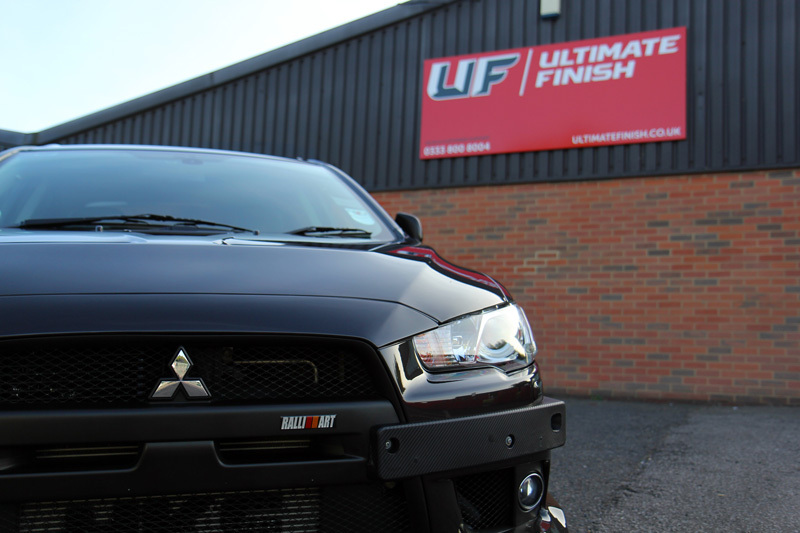 After Ultimate Iron Burn was rinsed away, the Evo X was degreased using Bilt-Hamber Surfex HD. This removes traces of oily road grime and diesel splatters which would otherwise interfere with the end step sealant. The engine and engine bay were also degreased, using a detail brush to ensure all grime was removed from around caps, nuts and bolts, to leave the engine sparkling clean. 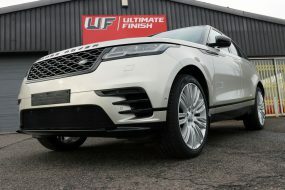 Finally, the car was treated with Ultimate Snow Foam, the high foaming solution clinging to vertical panels to lift larger particles of dirt and grit away from the surface. Once encapsulated in the foam, this contamination can then be rinsed away before a wash mitt comes into contact with the paintwork. The final step before the main wash was to treat the hardened water deposits. For this, Kamikaze Collection Silica Scale Remover was used to dissolve the evaporates. These were then rinsed away. 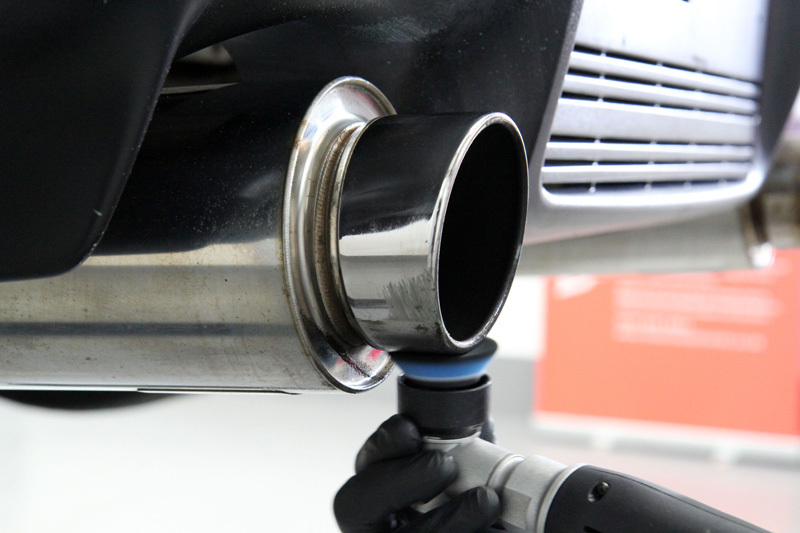 With the car free from contamination, it was then washed using the Two Bucket Method, an Ulti-Mitt Double Sided Merino Wash Mitt and Nanolex Pure Shampoo to ensure no residues from dirt or from silicones remained on the car. After rinsing the suds away, the car was then given a pure water rinse using water from an Aqua Gleam De-Ionising Water Filter. Connected via a hose to the tap, this filter neutralises the elements in tap water that cause unsightly and potentially damaging water spot marks and leaves the paintwork with an extra gleam! 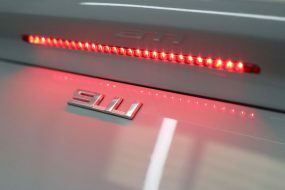 The Evo X was dried using soft microfibre towels before being brought into the studio where the paintwork was inspected under high-intensity lights. The scratches and swirls were easy to see. Paint correction required a FLEX PE14-2 Rotary Machine Polisher with Menzerna Super Heavy Cut Compound 300 and a Flexipads Soft-Buff Yellow Polishing Pad. 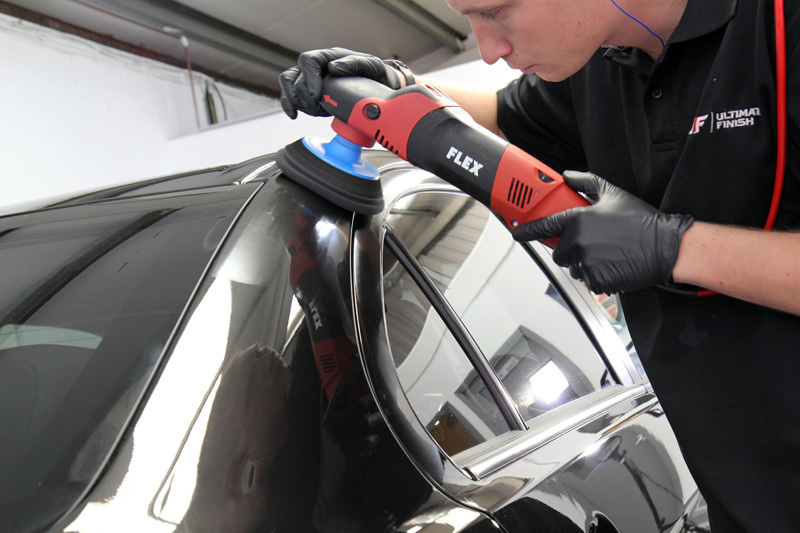 The Flexipad has an open cell structure, allowing for optimum airflow, helping to reduce heat build-up which could cause marring in the soft paintwork. Combined with the aggressive compound it provided enough cutting action to eliminate the swirls and reduce the appearance of the deeper scratches. For the door panels, edges of the boot and other, smaller areas, a RUPES BigFoot Nano iBrid was used with a FLEX Heavy Cutting Spot Pad. 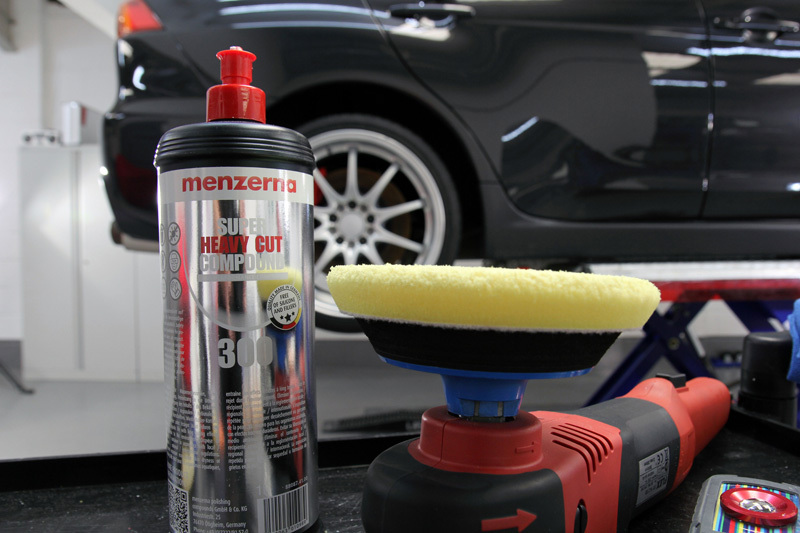 To refine the finish, a 3M PERFECT-IT III High Gloss Polishing Pad was used with Menzerna Super Finish Plus 3800. Several passes were required to eliminate the fine holograms caused by the cutting process. Soft paint is easy to cut back but trickier to refine as it marks so easily, it’s hard to bring the gloss up without causing additional marks. However, Menzerna Super Finish Plus 3800 works well on soft paint, providing just the right level of gloss whilst removing any holograms. The proliferation of stone chips required a ChipEx Paint Chip Repair to be carried out. ChipEx uses the manufacturer’s paint code to exactly match the colour of paint, making the repairs much less obvious than with standard stone chip solutions. 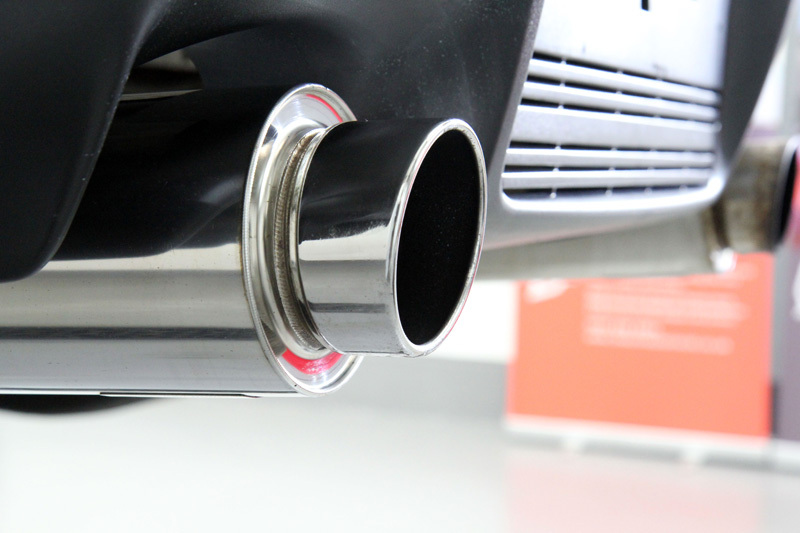 The exhaust tip was tarnished and covered in oxidisation to the extent that it required machine polishing. A good test then for Britemax Metal Twins used in conjunction with a RUPES Nano iBrid and the appropriate spot pads. Britemax Metal Twins is a two-part system: Easy Cut removes tarnishing, oxidation and staining. Metal Twin 2 Final Shine is a polish and sealant that brightens and protects the metal against future damage. 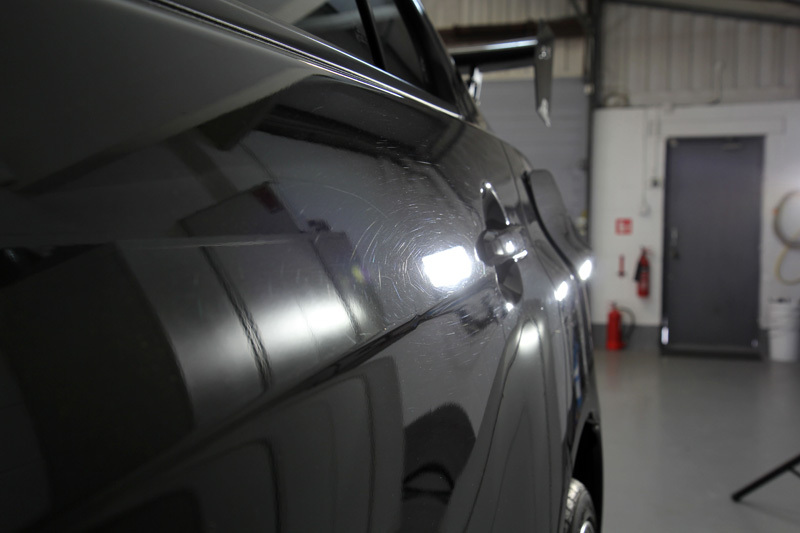 For the paintwork, Kamikaze Collection Miyabi Coat was used to protect the finish and enhance the shine. In the Japanese language, “miyabe” represents the idea of the pinnacle of elegance and refinement. 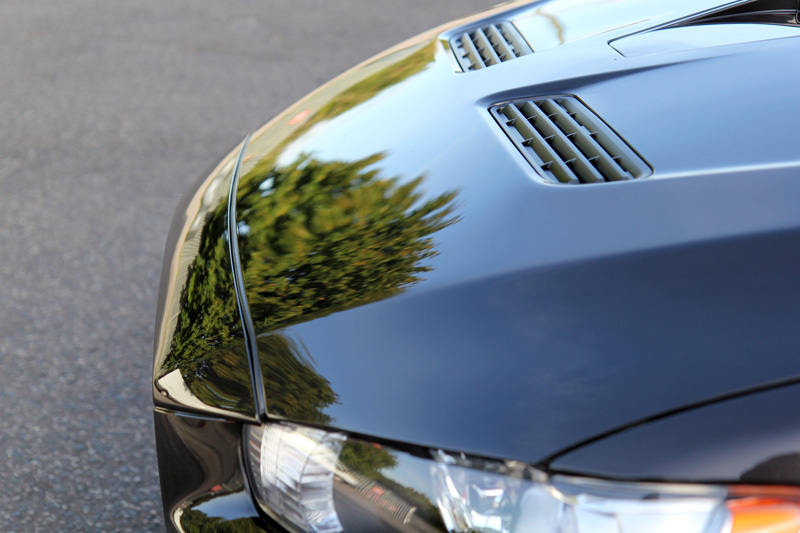 Kamikaze Collection Miyabi Coat is a next generation protective coating that brings out the elegance and a deep reflective gloss in paintwork, whilst the high silica (Sio2) content provides durability and resistance to chemicals. In addition, Miyabi Coat contains smaller molecules than the average glass coat sealant, making it is less prone to water spotting. 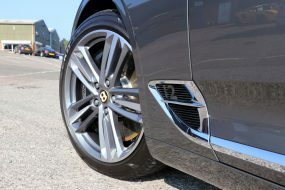 The wheels were coated with Gtechniq C5 Alloy Wheel Armour to provide a heat resistant, hydrophobic and oleophobic barrier that also inhibits the build-up of brake dust. Treated surfaces are therefore easier to keep clean, negating the requirement for washes containing harsh chemicals which over time can impact the integrity of the protective lacquer. 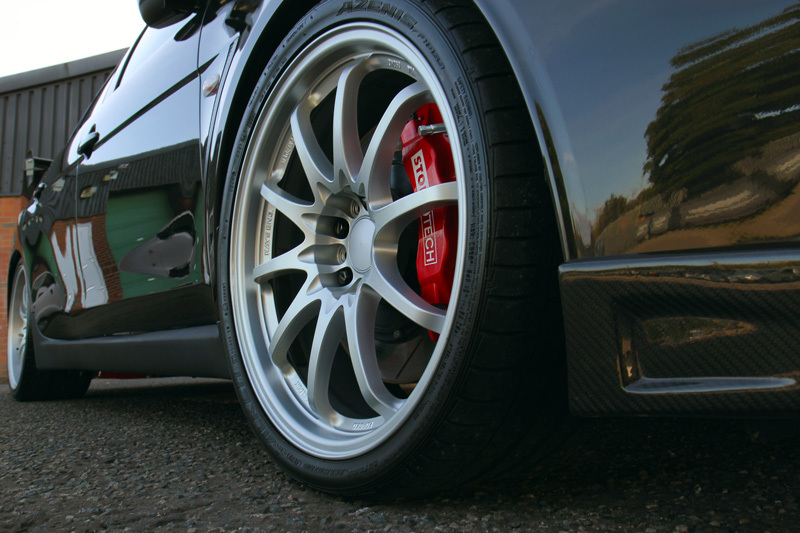 The tyres were dressed with Gtechniq T2 Tyre Dressing to provide a natural satin finish. The plastic trim and spoilers were coated with Solution Finish, a product undergoing performance testing in UF’s Detailing Studio. 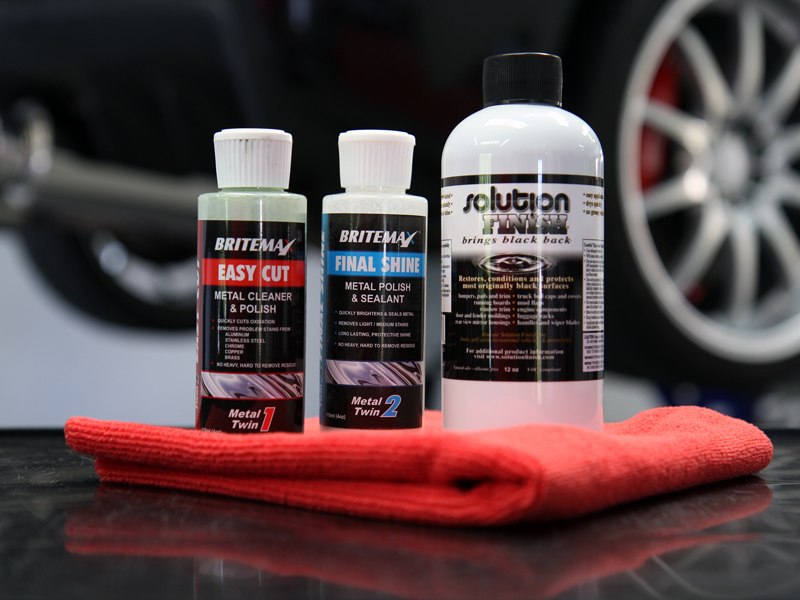 Solution Finish is silicone-free, uses advanced polymer technology to restore colour and condition to plastic surfaces, so in addition to restoring the trim back to a natural satin black, it also protects from UV fade for up to two years. The windows were sealed using Gtechniq G1 ClearVision Smart Glass, providing a water-repelling barrier that encourages rainwater to bead on contact and blow away, even while driving at relatively low speeds. As an added benefit, the hydrophobic nature means snow and ice cannot bond as well to treated surfaces, making early starts easier on frosty mornings! 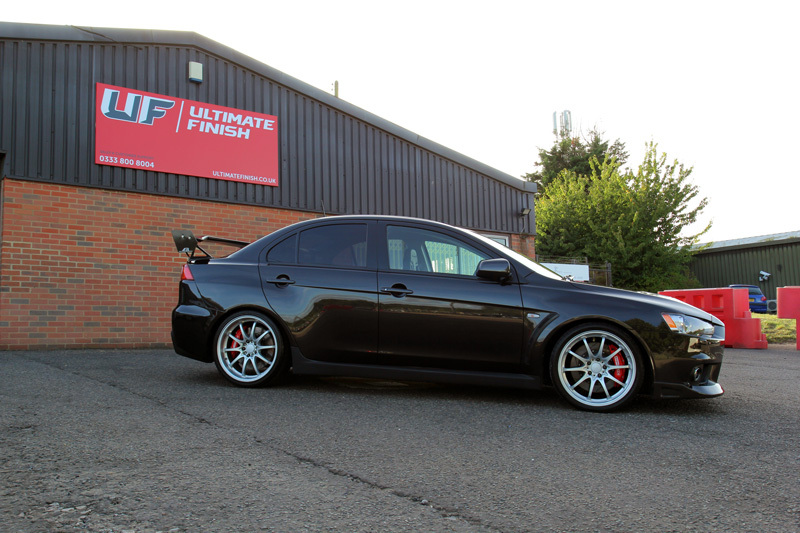 Corrected and now fully protected, the Evo X was ready to light up the roads for another few years! UF Detailing Studio – Award Winning Detailing. Call 0333 800 8004 to discuss your requirements. A Classic Mercedes-Benz 190 SL – The Hottest Ride In Town!